Every Moment Counts is the true story of Mary Butterwick who sold her house to fund opening the first hospice in the north east of England. How often have you longed for a better world only to be discouraged by a never ending list of, if only? So often we tell ourselves, if only we had more money, power, knowledge or influential friends, then we could really make a difference. Mary Butterwick OBE had none of those things, yet against all odds she followed her dream to provide better care for people with life-limiting illnesses and their families – care that she and her late husband, John were heartbreakingly denied. At an age when she might have retired, she not only brought hospice care to north east England, but helped to change hearts about how special the time at the end of one’s life can be. To Mary, a hospice was not simply somewhere we go to die, but somewhere we can enjoy living to the last. Her inspiring story encourages us to search, to question and to wrestle with the implications of what we say and do every day. It challenges each of us to really live until we die and to have faith that one person, no matter what age or circumstance, can help to create a better world. This is a remarkable story of faith in action and of selfless service to others. …..read it for yourself and be inspired.” Professor Dr Edwin Pugh MBE. This is the story about the difference that one person can make. Nowadays we tend to expect others to meet our needs rather than accept responsibility ourselves; everything is so complicated we don’t know where to start. But we are all dependent ultimately on the vision of a number of individuals who are motivated somehow to make change. Mary Butterwick, at first the most unlikely candidate, is one of them.” Rt Revd Stephen Pedley. 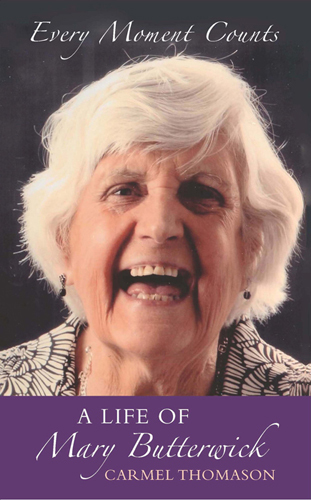 “Carmel Thomason’s account of the life of Mary Butterwick will appeal to many. If you enjoy reading biographies, if you are going through a time of grief or despair, if you are interested in the hospice movement, it is a book for you. The pace is fast, yet the deeper issues it raises are ones we all struggle with at times. The answers Mary found are very practical and caring ones”. – Julie Martin, minister of Barnard Castle, Low Row and Keld United Reformed Churches, Reform Magazine. “A story that deserves to be told and Carmel Thomason has done a service in telling it.” – Pat Ashworth, Church Times. “Fascinating story, inspiring words – simply couldn’t put it down.” – Sarah Dale, Evening Gazette, Teesside. The story of hospice founder Mary Butterwick – Teesside Evening Gazette. February book of the month – Teesside Evening Gazette.